Visual LANSA Framework's prototyping capabilities take LANSA's traditional productivity even further. Piraeus MultiFin SA, based in Athens, Greece, is one of the country's leading finance companies for the automotive, motorcycle and marine sectors, both in retail and stock financing. Piraeus MultiFin used Visual LANSA Framework to redevelop its core line of business system, transforming it from a green-screen legacy interface to a modern web application. The system provides secure web access to over 400 car dealerships and numerous customers, collection partners and other stakeholders. George Drakos, Managing Director at MultiFin, says, "Our customers, staff and external stakeholders all benefit from the system's productive user interface, improved functionality and easy web access. The system has reduced the time it takes from application to approval, making us more competitive. We have improved customer service and lowered our operating cost structure and achieved all this with modest resources and our own small team of two LANSA developers." We have improved customer service and a lowered our operating cost structure. IT team, left to right: Gakis Karageorgas, Dimitris Karanikolas, George Gerakis, Panagiotis Zaxariadis. Seated: Costas Kelaidis, Zana Tzia. Piraeus MultiFin (MultiFin) was established in 1998 and is a member of the international Piraeus Bank Group, one of the most dynamic and active financial organisations in Greece, with over 350 branches in Greece and more than 500 branches in South Eastern Europe and Egypt. MultiFin's main business is in the automotive industry, with smaller operations in the motorcycle and small vessels industries. The company operates primarily in stock financing, meaning it purchases vehicles on behalf of its dealers and then sells them directly to the end customer, financing the purchase at the end. The company is also active in retail financing, where it finances individuals to purchase vehicles under traditional financing schemes. Although 2009 was a very challenging year for the asset finance market, MultiFin managed to be profitable and improve its relationships with customers and other stakeholders. 2010 may prove to be even more challenging, but MultiFin feels well prepared. George Drakos, Managing Director at MultiFin, explains, "In a business where you cannot differentiate in price, providing good customer service and keeping your costs down become the two major driving factors for success. Our IT systems help us to continuously improve in both and we view our investment in technology a key element in building a sustainable competitive advantage." From the establishment of the company MultiFin selected LANSA as its development tool, the main reasons being LANSA's development productivity, short learning curve, repository based architecture, the proven stability and being able to maintain a large system with a small team. 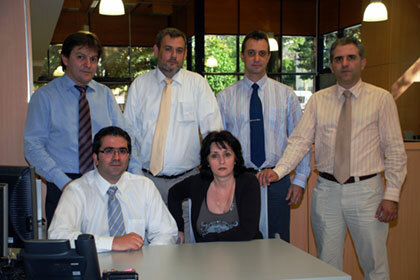 Also MultiFin´s parent company, the Piraeus Bank has been using LANSA for its systems. MultiFin built the first version of its system with RUOM, LANSA's object oriented prototyping and development tool at the time. From 2000 onwards, dealer partners and collection partners were provided with an interactive web application to access to the system over the Internet, developed with LANSA for the Web. However, MultiFin's internal users were still using the traditional 5250 system, originating from the nineties. The system served the company well, but as time went by, the legacy green screen user interface became unpopular, especially with new users who considered it intimidating, unfriendly and hard to learn. Moreover, the interface lacked productivity as users could only open one screen at a time. In addition to providing a more user friendly and productive user interface, MultiFin also wanted to modernize its systems with better email and Microsoft Office integration, plus real-time integration with external business partners. When MultiFin needed to deliver major new functionality to its system, the company decided the timing was right to upgrade its development environment to Visual LANSA Framework for both the delivery of new functionality as well as for the redevelopment of the existing system. "We were used to LANSA's productivity in the traditional development environment, especially its template and repository features, and could see that Visual LANSA Framework's prototyping capabilities could take that productivity even further. We also felt that the framework development approach would result in consistent program quality and disciplined development standards," says Gakis Karageorgas, IT Manager at MultiFin. MultiFin's is well on its way to redevelop its entire 5250 core system, roughly consisting of 1,500 programs, to modern web applications. At the time of this case study, the Collection and Financial stock modules were already fully converted and implemented. Over 60 percent of the Loan and Commercial modules have been redeveloped, while the General Ledger module will be modernized last, possibly using LANSA's RAMP phased modernization rather than full redevelopment with Visual LANSA. A critical issue that came up during the project was the need to deliver new functionality for the existing 5250 system, alongside development of the new graphical system. Implementing an inconsistent mix of new and old user interfaces was not acceptable. As a result MultiFin was faced with the challenge of parallel development. To minimize duplication of development effort, Mr. Karageorgas made use of LANSA's complete segregation of the user interface and business logic by defining the business rules in the LANSA Repository and the technique of including common code in both the old and new system. Users are enthusiastic about the new system says Mr. Karageorgas. "The new system offers a far more friendly and familiar user interface, resulting in faster user adaption. The number of support and training requests has significantly decreased. Users are particularly happy with the easy search and multi-tasking features and tight integration with MS Office, enabling them to directly send email and work with PDF, Word and Excel files, without having to leave the core system. Integration with MS Office has never been so simple." A major difference between the old and new system is the usage pattern, according to Mr. Drakos. "In the old system users were inclined to remain within the limited usage of their daily routine and less likely to venture out and find the systems real capabilities. It was not uncommon for users to request upgrades to the system that were already built in. The more welcoming nature of the Windows based system encourages the user to explore the system's potential, whereas functionality was previously hard to find." Users are particularly happy with the easy search and multi-tasking features and tight integration with MS Office. The new system has helped to improve the workflow between MultiFin's internal departments as well as with external parties. The most significant external application is the dealer web application. "The dealer site provides direct secure access to MultiFin's data and applications, allowing for effective communication with customers and sales points. Also, having a web presence in the dealer's showroom makes MultiFin more approachable in the eyes of the customer," says Mr. Drakos. "The dealers' ability to input a loan application directly into the system has reduced the time measured from application to approval, thus boosting our competitiveness. At the same time it has reduced administrative costs because it now takes less effort to input and process a potential retail customer in the system." Another significant improvement according to Mr. Drakos is improved accuracy. By moving the responsibility for data quality directly to the source, there has been a sharp decrease in errors and misunderstandings. Previously MultiFin staff had to enter the loan application, with all the delays and inaccuracies associated with paper forms and re-keying of data. Now staff gets automatically alerted regarding new applications and the next step that needs to be taken. Application approval is only the first step in the process. The web interface allows dealers to monitor the loan's completion process until disbursement, thus reassuring them that all is done in a timely fashion. The process cuts costs for both MultiFin and its dealers, as it reduces the number of enquiry phone calls and encourages efficient email communication. Once the loan is complete, the system's integrated document management facility ensures faster exchange of legal documents and reduces the paper flow. Other external stakeholders benefit from direct web access as well. These include the bank's risk and Basel II teams, both of which are in constant need of information to perform data mining operations to fulfill their task. "The system helps to reduce the amount of time our staff needs to spend communicating this information, while at the same time improving our transparency towards our shareholders," says Mr. Drakos. MultiFin's collection agencies also have web access to the system. MultiFin can assign cases for collection to the appropriate agency and monitor the progress and quality of the work they perform, as the agencies update the system online. Mr. Drakos feels that the quality and completeness of information has improved, as the database now contains the totality of MultiFin's relationship with the retail customer. If a car is sold with dealer recourse the dealer can check whether his customer properly pays the installments, otherwise the system limits the dealer's access to safeguard confidentially. Last but not least, MultiFin's sales and audit team members on the road also have web access, making their customer visits more effective. We have reduced the time measured from application to approval, thus boosting our competitiveness. Mr. Karageorgas feels that is has been very important to the success of the project that the application transformation was achieved by MultiFin's own small IT team. LanSoft, LANSA's partner in Greece, provided training and technical assistance, but the actual redevelopment was done by just two of MultiFin's developers. "LANSA provided the tools and training to make this project a success using very few resources. With Visual LANSA Framework a small team of just two developers managed to deliver roughly 1,000 programs, while also being responsible for the continuous maintenance and improvement of the existing system. The framework's standard MS Outlook-style user interface, easy proto-typing and evolutionary development and deployment cycle made this possible," concludes Mr. Karageorgas. "Our customers, staff and external stakeholders all benefit from the system's productive user interface, improved functionality and easy web access. Our IT team is excited about using LANSA's modern technology and feel more job satisfaction being able to support a sophisticated web application that is used by both internal and external parties. End users find the new system far easier to use and feel that their work environment has greatly improved. Management is pleased because all of the above has been achieved with modest resources and has resulted in a lower operating cost structure," concludes Mr. Drakos. LANSA provided the tools and training to make this project a success using very few resources. Piraeus MultiFin operates in the area of financing the purchase of both new and used vehicles, as well as motorcycles and small vessels. The company works with more than 400 car dealerships, including the several of the country's major dealers. The system is used by 90 internal users, 400 dealers and 80 other parties. Piraeus Bank Group is one of the most dynamic financial organizations in Greece. Founded in 1916, Piraeus Bank went through a period of state-ownership and management (1975-1991) before it was privatized in December 1991. Since then, it has continuously grown in size and activities. LanSoft is a LANSA business partner in Greece, specializing in application development for the IBM i platform, including systems for warehouse and inventory management, car leasing and the super market retailers.